Last year, on 11th April 2011, my main site (certainly not this one!) was mercilessly ripped to shreds by the now infamous Google Panda update. I lost over half my traffic and three-quarters of my revenue overnight. I was so desperate I started doing jobs for other people. But, I made a full recovery about 8 months later and all was well. 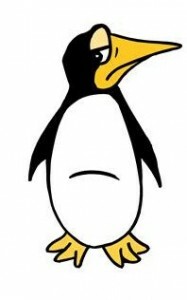 On 24th April 2012 Google rolled out its latest major update, Penguin. While Panda tackles low quality content, Penguin tackles low quality SEO. OK, before I carry on waffling I must point out that this is not fact, just my thoughts. If you ever meet me you will quickly learn that my thoughts are not the most coherent or logical at the best of times, and at the moment I am feeling a bit peckish. On the 24th one of my sites was affected by Penguin. The site was also affected by Panda, but I also recovered this site. The final recovery only came about a week or so before Penguin! Fortunately the site was not a big money earner, although I always had hopes that it could become something much better in the future with a little nurturing. But it is this site being hammered that makes me think that Penguin is largely about low quality SEO, and that includes on page SEO. What Panda taught me was that when Google says that a penalty is automated and can be fixed, they are not lying. You need to take a good, long look at your site and scrutinise everything. Ask yourself “what is the problem?“. At the moment a lot of people are up in arms about Penguin, screaming that Google has lost the plot and the SERPs are screwed up. Well, I am not seeing that. When you are the victim things always seem much worse. Shows 2 days traffic per hour against the 2 days prior to that. The drop is 9pm GMT on the Tues 24th. There is a lot of talk about negative SEO and that Penguin is hammering sites that did cheap and nasty link building (spun articles, directories, comment spam etc. etc.). While this may be part of the problem, it certainly cannot be the whole issue because for my site I never did any SEO (I did hire an SEO firm in 2009 to do some directory submissions, but the last time I checked not many of their submissions were ever actually published anyway, or the sites no longer existed. They were a bit hopeless really and that was the last of that!). So off page SEO cannot be causing a penalty. My suspicion is that some cheap SEO no longer works, it will not rank a page so highly, but it will not penalise. Some websites are declaring that sites affected by this latest update have been doing “black hat SEO”. This really does not appear to be the whole picture, although I am seeing plenty of results that have been dumped, and did use XRumer to generate thousands of links. Cause and effect? Who knows? Keyword spamming on your pages. I spotted a potential problem on my site (and changed it). My page titles were possibly over-optimised as I had both WordPress and an WordPress SEO plugin insert the site name into the page title in error. So I had the same keyword phrase repeated twice on many pages. This looks stupid in the Google SERPs and I suspect that this is a problem. A quick edit of the header.php of my WordPress theme removed one of the mention of the site name. The site spun off from my main site a few years ago. There is a fair amount of interlinking between the two as would be expected. Maybe this is a problem. I have removed some of the links from the Penguined site to the un-Pandered site. The site still ranks OK for its name and a few terms. I get the impression it is just a case that it has dropped a few places for a range of search terms – I never really looked to see what people were searching for though so not sure what it no longer working. With Panda my site / many of its pages were dumped from the top of page 1 in Google to page 2 and beyond. With Pengiun the site has dropped just a few places. This still makes a dramatic change to the traffic to the site, but it is not such a huge drop in terms of search positions. I suspect that having a weak link profile is probably as much of a problem. Other than a few comments and the odd guest blog not done much (plus directories as mentioned above). So weak SEO and “over-optimised” titles may be my problem. I can fix the titles (have done so already) and I can do some marketing on the site to improve its SEO. I can also fix the interlinking. What I cannot fix though is the domain name (this may be considered spammy, I really do not know!). However, I feel that like Panda, Penguin is something that a little (or maybe a lot) of work will fix. “Another step to reward high-quality sites” by Matt Cutts. “New Google Webspam Algo Coming Soon” discussion on Cre8asiteforums.